Another week gone by and boy what a busy week. We had a surprise visit from my eldest brother for the bank holiday weekend. He popped over from London so it was wonderful catching up with him, then we hit into some really sunny warm weather and I took advantage to get some good housework in and then just yesterday I got a call to go into my Mum’s and there I was going in the road thinking something was wrong and when I got in there my sister had arrived home from Australia as a surprise, she has a course booked starting in September for some further training so when she travels again, she will have better qualifications, I was just so excited as I have missed her very much. All of this did not leave much room for knitting. I got some done. This weeks cloth was Koala Cloth which I knit up for my sisters newborn son, well he’s 2 and a half month’s now. She to lives in Australia so if I could get her home to see more of them I would be jumping out of my skin altogether lol. The other thing I’ve been concentrating on is the pinwheel blanket, I could see the end in sight and I was itching to try out the edging. Thank you all for answering my questions last week and guiding me to the finish. You all got what I was trying to accomplish and the shell stitch was just the effect I was looking for. I understood the US terms and could translate them over, as I say I just don’t crochet enough or practise enough to have much confidence with it. The pinwheel finished at 570 stitches round and this lent itself to skipping 2 chain, dc in the next, skip 2 chain, 5 tc in the next and it all fit in perfectly. A close up of the edging. The Rib a Roni hat I was working on with Ruairí is not going to work out. I thought the cast on seemed a little small but decided to give it the benefit of the doubt until I had knit up a bit, which I did and it was just to small and that was the youth size so I decided to scrap that and I’m now going to try out the Strib Hat. I need to get another colour for Ruairí so he can have a stripe in his but Benjamin has two shades of blued already picked so I’ll start with his. On the baby list I’ve been looking at some patterns and looking at others so some I’ll be taking out and changing for others I’ve found which I prefer better. I’m also going to start this week on a second blanket I want to knit which is going to be a crochet granny square one. I started some squares before but I’ve run out of those colours and can’t locate those shades so I’m going to use some lemon and white which I’ve found in my stash. This is about the only Granny square I know how to do so I’m going to just do up enough squares and join them all together. If any of you crocheters have any tips on this please do let me know ? This is how the list looks now. Tonight sees the closing ceremony of the Olympic Games and I’m sorry to see them end but I have enjoyed them immensely. Looking forward to catching up with all your yop posts. This entry was posted in Uncategorized and tagged Koala Cloth, Pinwheel Blanket, Rib a Roni, Strib Hat. Bookmark the permalink. The shell looks great on the blanket. Sounds like you had a great week. Hope next week is as nice. The edging on the pinwheel blanket turned out perfectly! I hope your Strib hat gets off to a good start! Wow … what a great pinwheel blanket !!!! I love surprises. Having Mum home must be amazing.I love your washcloth it's perfect for your sisters baby. 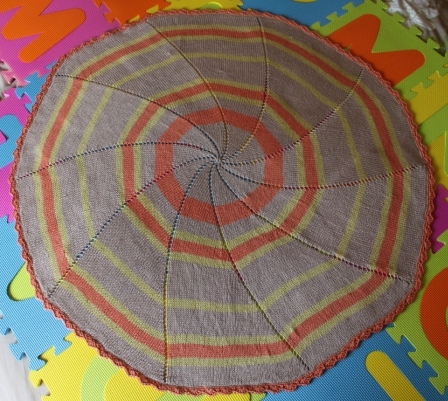 He's going to love it.The shell edge is absolutely perfect for your pinwheel blanket. Love the blanket. It's beautiful! The shell edging was perfect for the blanket. The whole thing turned out so wonderful. I really like the look of the Strib Hat and think it is a bit more 'dashing' than the rib a roni.You are making great progress and am so glad you got to see some family this past week. How lovely to have your family come visit, especially as your sister is so far away!Love the pinwheel, you did a fab job on the shell stitch edging, looks exactly fitting for it, it seems like it knitted up quickly, I think your needles must smoke when you knit!I reckon the granny blanket sounds lovely already in lemon and White….don't really have any tips, but you may want to look at a pattern that you join the squares together as you go, some people prefer it to having to sew all together at the end….loads of people have tutorials on their blogs, I'm sure Lucy attic24 probably does too.Have a great week Ruth! I just noticed you have the Pendleton cowl on your list of maybes– I love that pattern and am completely intimidated by it. Is it wrong to hope you make it so I can watch from afar? How lovely to have ohana time, esp w/ppl you don't get to see very often.I am so amazed by your Pinwheel Blanket, Ruth. It is perfecto!OMGosh and you're going to hook another? You are so patient and adventurous. The shell is perfect…your excitement about visiting with family comes through in your post… 22 weeks…I love those charts that let us know where you are in your pregnancy! Gorgeous blanket! The edging looks great! You have done a great job with the edging. It's looking gorgeous! And what a good surprise, I wanted to do the same for the wedding of my cousin, but the money passed in the repair of the car. I was so sad! A surprise visit from Australia, I bet you were excited to see all your family, and all the once too. And your pinwheel blanket is beautiful, the edging is perfect! Your pinwheel blanket is lovely, and the edging suits it perfectly – love the colour!For granny squares, the two places I go are Lucy at Attic 24 who has some patterns, and also instructions on joining as you go, which can save you time. 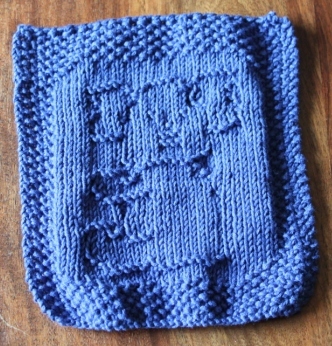 The other place is Marie at Underground Crafter, who is a real Granny Square expert – she makes hundreds of them in all different patterns, and links to most of them so you can have a go yourself. Also, if your local library has Melody Griffiths "201 crochet motifs…" or pretty much anything by Jan Eaton, they should be able to give you some ideas. Enjoy! Yay, I'm so glad the crochet edging worked out. 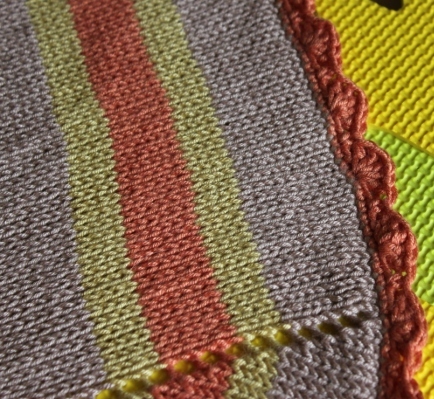 Your blanket is such a stunner, and the edging is really the icing on the cake! what a grand surprise that was to see your sister! I love the little koala cloth and adore your little spiral blanket with the shell edging. For the granny squares you might try doing a join as you go method. There are quite a bit of tutorials out there – try Pinterest or google. FANTASTI job on the Pinwheel! Wow! and that edging is amazing! Keep us posted on your Granny's, I would love to pick that up one day!